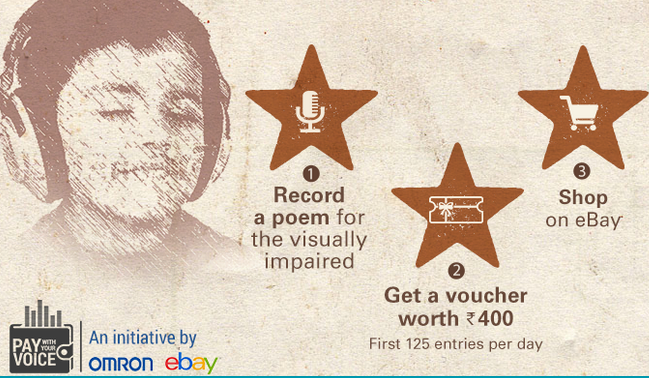 Your Voice,Their world offering Ebay gift voucher worth Rs 400 on submit a recorded poem.This offer is live till 12th october.So Hurry!! and just record a poem and get free voucher with campaign #Paywithvoice. 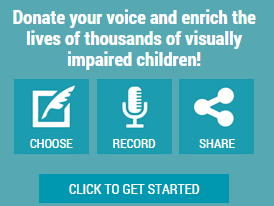 About Your Voice,Their world- Yourvoicetheirworld kind initiative by OMRON and National Association for the blind,Delhi.Its aim to create the worlds largest audio-library of poems for the visually impaired. Don't Waste Your Time and Follow below Steps. 2.Click on Record,But before it Login With Facebook Account. "I WANT TO RECORD AN EXISTING POEM"
4.If you Go With "I WANT TO RECORD A POEM THAT I HAVE WRITTEN OR READ".Then first Upload Text >> RECORD >> REVIEW >> SUBMIT. CHOOSE POEM >> RECORD >> REVIEW >> SUBMIT.Make sure Read all instruction before recordings a poem then click on red button for record.If you have already recorded poem then you can upload it directly. 5.Done.You will get Rs 400 worth Ebay voucher in your email id. Read Carefully All Terms And Conditions From Offer Page.